Gerry Burrows combines science fiction and classical Greek and Roman architecture in this 28′ long colossus called Garrison of Moriah. Its height falls just a few inches short of 8′, only to be limited by the ceiling of the workroom. The idea behind the build has nested in Gerry’s mind for years, but it finally came to being when Gerry bought a new house with a custom-designed room to accommodate the creation, which took 9 months and over 200,000 bricks (thankfully Gerry has an understanding wife). 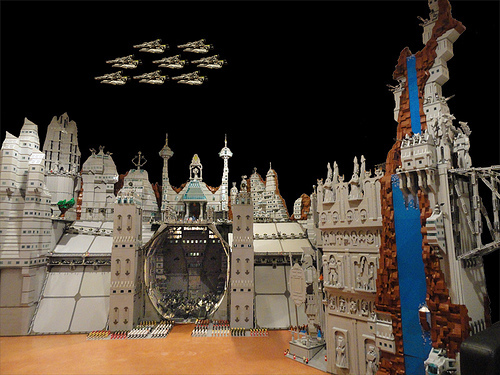 Some of the highlights include a gladiator stadium, a giant waterfall, and a cavernous spaceship hangar. UPDATE: Gerry has added more pictures to the gallery on Flickr including photos of the finished bridge. I’d love to get some technical details, sketches, and a video of fly around of this masterpiece! I’m not sure “mega” is enough to describe it. Impressive is all I can say while being completely enchanted by its detail and size. Definetely something to check out.